At ICR Electric, Inc., we know that our customers want their experience to be efficient and convenient. 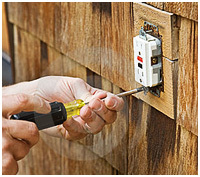 They require a wide selection of services about all areas of electrical installation and repair. Our client satisfaction is our highest priority. Our licensed and insured technicians can handle any job order in a fast yet efficient manner, as well as they wear their name tags and use show covers for all tasks in order to keep your residence or business as clean as possible. For more information on our services, request a quote for the work that you need to have done, please contact us (330) 576 - 6106 or what you need via our Quote Request Form.